The records of The Retreat asylum, in York, present some fascinating data for textile and costume historians. Possibly the most valuable of all the tens of thousands of pages of records, are the Patients’ Disbursement Books. These recorded patients’ spending money and also monies patients earned from work, themselves. In the late eighteenth and earlier nineteenth centuries, there even seems to have been a full blown micro-economy of patients repairing clothes for eachother and some patients spinning and knitting for the benefit of others. We can’t know whether this was thought to have therapeutic benefits, or whether it was an accidental by-product of the enlightened way in which The Retreat was run by its founders, the Quaker tea-dealing family, the Tukes. 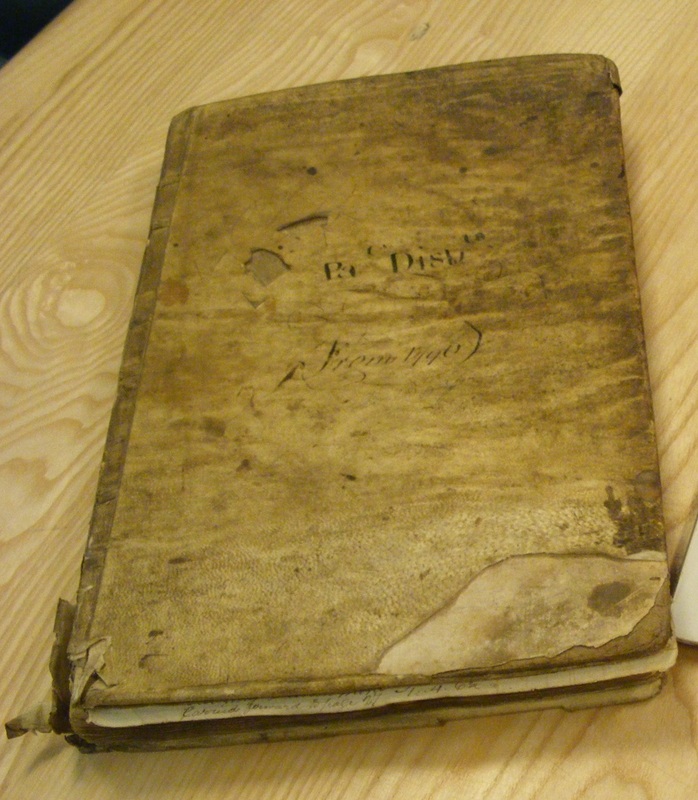 The Disbursement books have accounts for named patients; each patient having their own pages, and interspersed amongst them, are records of the patients’ work, or what is referred to as the “Work Book sundry patients making and mending and knitting etc”. These records were kept from 1796 onwards, and randomly interspersed with the individual patients’ spending accounts, are pages titled “Men Patients Work” or sometimes “Men Patients Work With Some of the Women’s”. Either way, we’re privileged to glimpse these lost and long forgotten lives. Come with me, a moment, and we will step into the elegant confines of The Retreat, and see what we can find out about our ancestors’ knitting and hand spinning. In 1799, patient Judith Robertson spent 3d on “knitting needles”. In 1802, John Summerland had: “A shilling for Cotton for foot of stocking” – which suggests the expense of cotton stockings as opposed to worsted. Frequently, patients were paid only 2 shillings and sixpence to knit a pair of worsted stockings. In 1807, “stocking worsted” cost just 10d. Re-footing stockings was an ongoing thing. In 1808, Patient John Baker paid four shillings (20p) for “2 Pr Stockings & 2 Night Caps knitting”. John Gendry paid the same. By the middle of the year: “Patients work overall, Debit 15 £ 11s and 3d. Credit 15 £, 11s and 3d”. I.e: the books were balanced and all patients had paid for the work done for them. That is quite a volume of making and mending for a handful of months. In May, 1808, two patients were paid for spinning worsted. H. Hall got six shillings and H Woodville, 4 shillings and 11d. When you consider at around these dates, the last remaining hand-spinners in Yorkshire might earn about a halfpenny per day spinning several ounces of wool, then 4 – 6 shillings represented a lot of spinning. By the end of September, The Retreat’s Knitters were two shillings and 6d in credit, but by the last day of the year, they were ten shillings in credit. This might suggest knitting was something of an autumn/winter activity. “M Wilson wrested cotton 4-/… Worsted 2-/3d” [“Wrested” is an old word for “tightly twisted”]. In December, 1815 M Wilson was credited with five shillings and 6d for knitting 4 pairs of stockings. Over the years, again and again M. Wilson is recorded as buying or spinning worsted. The Retreat used worsted to make, repair or re-foot stockings. Throughout 1817 and 1818, “M.W” was repeatedly paid for worsted. Although in March 1817, patient Christopher Choat paid 7 shillings for “2 Pr Lambs’ Wool stockings”; so stockings could be woollen spun as well as worsted. (Dales knitters and Yorkshire farming families routinely knitted worsted stockings for commercial mills and woollen stockings for their own home use). In 1807, Valentine Johnson paid “M.W” four shillings and 5d for a pair of stockings. In 1808, Sarah Impey paid two and six for “Lambswool Yarn for Stockings” and 8d for needles. In June 1818, Elizabeth Hanbury bought “silk stripe stockings” although their price was rolled in with other items: “muslin, Dimity Crape, Parasol, Sarsnet.” for which, altogether, she paid four pounds, one shilling and 5d. Several times, patients bough “knitting cotton”. We can only speculate what was made from this.In 1817, Sarah Brady was paid a hefty three pounds for “Thread”. Sometimes, eighteenth century (and earlier) accounts mention “thread stockings” – as distinct from Lamb’s Wool, cotton, silk, woollen or worsted. I am not sure, but it is possible ‘thread’ meant two colour? They seem to have been expensive: in 1809, Sarah Harris bought a pair of stockings for one and six, but also a “Pr of Thread Stockings” for 4 and 6. In ‘The Old Hand-Knitters of the Dales’, it is recorded that during the early part of the nineteenth century, Yorkshiremen still knitted but, as the pack-horse roads into the more remote areas were improved, they got shyer about doing it in public as outsiders found it “quaint”. Behind the walls of The Retreat, male patients who could already knit, maybe continued to knit. The small income some patients made from their spinning and knitting would have paid for little luxuries for themselves. The Disbursement books record patients buying oranges and lemons, coffee, canary seed, strawberries, snuff, sweets, alcohol, tobacco and the latest books – including anti-slavery books, poetry and novels, as well as everyday expenses like hair cuts, shaving, mending of stays and shoes. 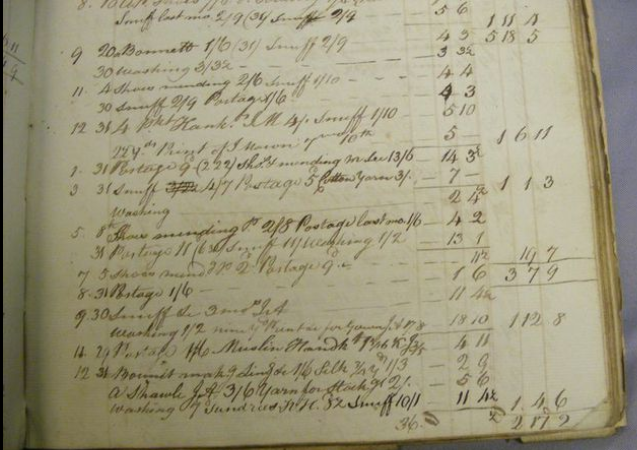 At the end of March 1812, the Disbursements record a shilling spent on “Tape and needles”. If these were knitting needles, then ‘tape’ might well refer to simple tape bands, often used to attach knitting sticks to the knitter. At least two of the extant knitting sticks at the Bronte Parsonage Museum still have remnants of tape attached to them. Whilst workaday knitters used leather belts, it seems some of the more genteel knitters preferred tape (and The Retreat had many refined patients). Much later in the century, a doctor was to record one patient, a Daleswoman, pretending to knit, using “a bit of wood” – possibly a knitting stick, although the doctor, unfamiliar with this, wasn’t sure what he was seeing. Dales gloves. (Originally pink and cream). I’ve reverse engineered these – pattern will be up soon! “30 Sept 1809 9d Shroud JA 5 s 10d Making 1s 6 d Coffin 63s Gravemaking 2/6” … (“JA” would be the person who made the shroud). His funeral cost three pounds, five shillings and sixpence. A modest send-off by standards of some Retreat patients. 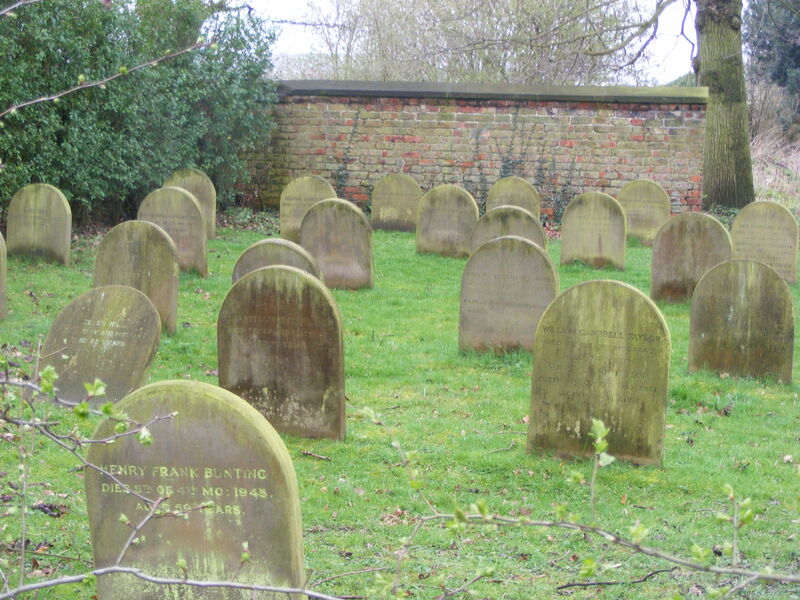 Most patients were buried in the Quaker burial ground behind The Retreat, which served for York’s entire Quaker community, not just the asylum – another measure of the humanity and humility of Quakers. But the Patients’ Disbursement books show the cost of funerals – and some patients’ funerals were far more lavish affairs than others. Gloves were knitted in their thousands in the Dales but rarely crop up in accounts so it was especially interesting to find these, here. (The mill account books Misses Hartley & Ingilby mention in ‘The Old Hand-Knitters of the Dales’ are no longer extant, sadly. Or at least, their whereabouts is currently unknown). In 1808, Mary Jackson bought “Mitts” whilst a year later, Mary Boone, intriguingly bought “Fleecy Gloves” for a mighty 4 shillings. 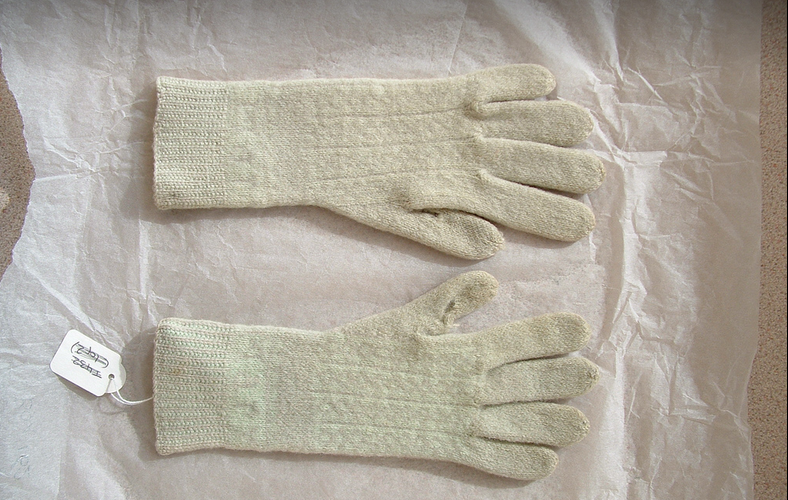 (It can’t be known for sure, but “fleecy” might refer to thrummed gloves, a bit like the famous Maine mittens?) In 1812, Thomas Atkinson paid two shillings and 9d for “yarn for Mufatees”. Rarely a named knitter makes something for a named fellow patient. In 1809, Sarah Impey paid four shillings and sixpence to “Mary Prideaux for a Pr Stockings of her knitting”. By the 1820s, mentions of the patients doing their own spinning, diminish although patients continued to knit. This reflects the death of the spinning wheel, out there in the world beyond The Retreat’s walls. From Case Notes it is apparent that many patients would never have been capable of spinning, at all. By the second decade or so of the nineteenth century, amongst patients’ occupations, ‘spinner’ becomes a male preserve and there are a number of textile related occupations amongst the inmates. This would not be surprising for an asylum in Yorkshire, but The Retreat was unusual in that it drew patients from all over the UK and Ireland and in fact only a minority of the patients were Yorkshire folk. A pack was around 20 stones (280 lbs). This would mean that the 5 shillings’ worth of wool the patients “spoil’d” would be about 1lb in weight – not a great deal of wool at all. The fact they were spoiling wool suggests there may have been patients teaching other patients to spin. As many hand-spinners learned to spin around age 5 or 6 – it’s not likely an experienced spinner, even a not very proficient/out of practice one, would be spoiling much wool at all. So this one entry tells us a great deal. You can read more about Crafts and The Retreat in the current (June) issue of ‘Family Tree Magazine’.